Adult male Tufted Duck at Cliff Lumsdon Park in Etobicoke, Toronto on 24 December 2017. 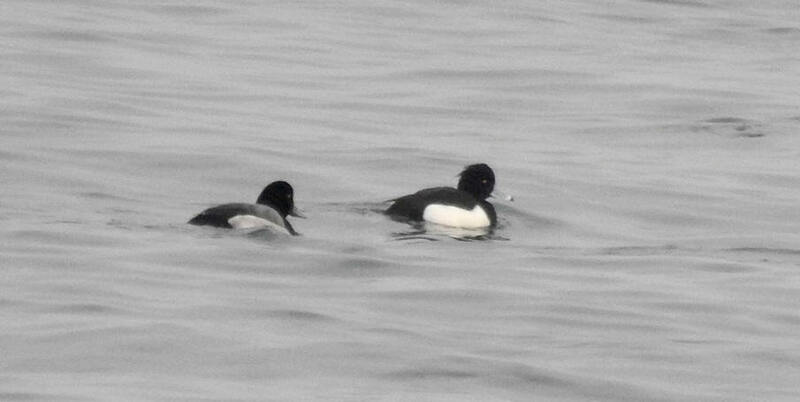 This male has same wispy tuft as the Tufted Duck last week in Mississauga. Pure white flanks suggest adult in winter plumage. Crest isn't full but is noticeable. Head, neck and back are black. Couldn't see a gloss on the head in the dull light and distance. Back is black, whereas it's grey on scaup. Bill is greyish with white terminal band. Bright yellow eye. 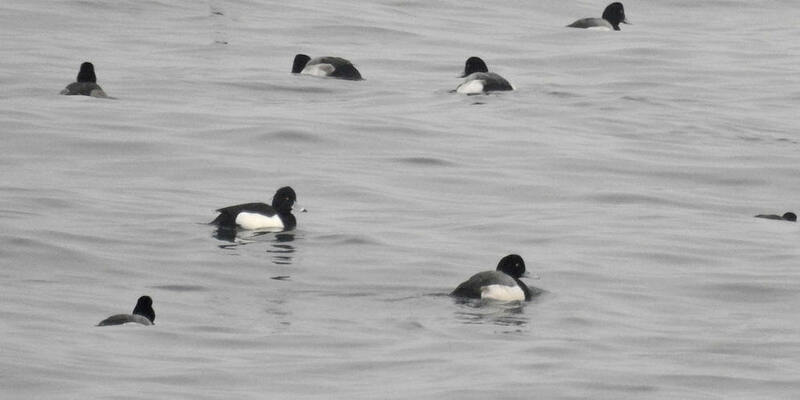 The Tufted Duck was in the large flocks of scaup on Lake Ontario at Cliff Lumsdon Park. 24 December 2017. Adult male Tufted Duck at Rotary Peace Park in Etobicoke, Toronto on 23 December 2017. Continuing male with wispy tuft. White flanks contrasting with black back, neck and head. Greyish bill with white subterminal band. 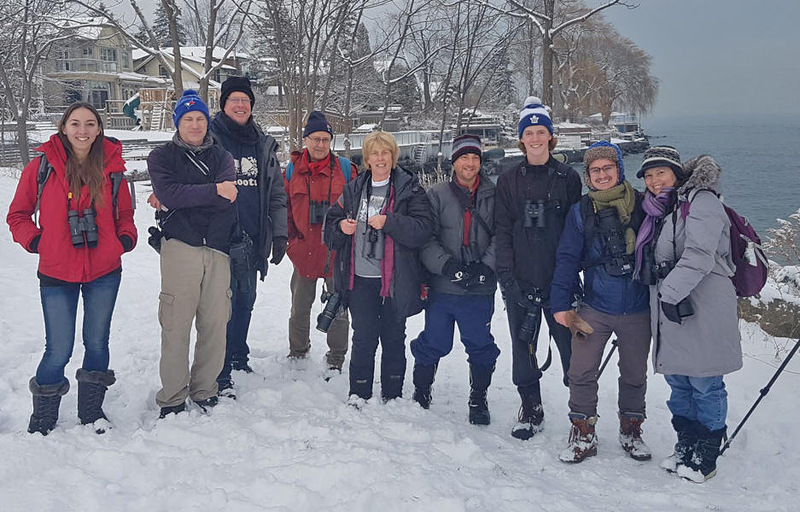 Great photo by Andrew Keaveney of Tufted Duck Watchers at Rotary Peace Park in Toronto, left to right: Amanda Guercio, Robert Baumander, David Pryor, Mark Cranford, Jean Iron, Howard Shapiro, Owen Strickland, Noland Pelland and Kris Ito. 23 December 2017. Part of a large flock of over 1500 scaup on Lake Ontario off Ben Machree Park in Mississauga on 21 December 2017. About 1600-1700 mostly Greater Scaup were in a large flock at Ben Macree Park and other areas in Mississauga on 20 and 21 December 2017, but the Tufted Duck was not to be found.